An empty room – a sigh of relief, and the satisfaction of a job well done. 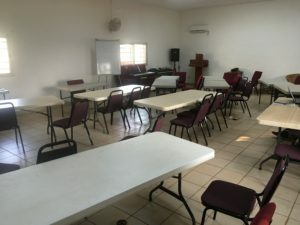 This picture shows the room following the translator training workshop that I attended while I was in Africa. I wish I could show you a picture of the room when it was full – full of people, full of energy, full of excitement – however, for many of the translators that we worked with, safety is a major concern. Having their faces posted online could lead to trouble for them. It is a reminder to pray for our brothers and sisters who don’t have the religious freedom that we have! But since I can’t show you a picture, I will try to paint a picture for you of what happened in this room. Imagine walking into this room and seeing it full of people. There are 11 translation teams with two to four members each. Most are men – on the eleven teams there are only four women. At least 12 ethnicities are represented, which also means that there are at least 12 different heart languages represented. Everyone in the room is speaking French, but in fact no one speaks French as a first language. Each person struggles to a varying degree to express themselves in French, and each person has to exercise some patience in decoding each other person’s individual French accent. All of these people are brought together by one common purpose – translating the Scriptures. Each person is given a notebook and pen as they walk in. Each team finds a table where they can sit together and introductions are made. The teams tell their translation progress. Some teams have not even begun to translate, and some are nearly done. But they all want to learn. There is an eagerness, a passion in the room that is evident as soon as the teaching begins. Hands are raised, questions asked, answers given. It is quickly evident that there is a disparity between African and American teaching and learning styles. The material presented is more difficult than the presenter anticipated. Further explanation, lots of models, and increased practice are necessary. But even this difficulty does not discourage the translators in the room. It is clear that they know that they NEED to know this information. Their desire is to bring the Scriptures to their families, their churches, their communities. They feel the urgency of having a clear and accurate translation, which means that everything said in this workshop is important to grasp and understand. Interestingly, not everyone in the room is of the same religion (How does that work?!? A question for another blog post…). Yet even those of different faith seem to feel the same urgency. They understand the importance of having accurate Scriptures, and they respect this book of faith that they are working with. At one point, discussion breaks out over how to respectfully check Scriptures with those who don’t believe. The conclusion is that we don’t want to pressure anyone into our faith. We want people to be free to choose. So those men of different faiths hear that their freedom is our desire. The workshop lasts three days, and by the end, everyone is tired. Information is tucked away for future use as notebooks are closed. But, before everyone leaves, a little celebration is in order. Someone turns on music, and each person receives a certificate of completion and a picture of their team. The men jostle out of the room to a meal of rice and sauce, tired but feeling accomplished. After everyone leaves, I come back to the room and take this picture – a sigh of relief, and the satisfaction of a job well done.